During the off-season is an excellent time to perform many routine maintenance procedures on your boat. It allows the luxury of time without the usual week-end deadline hanging over you. Let’s face it, if the choice is between greasing your u-joints and taking that week-end get-a-way cruise in mid-summer, service downtime will always take a back seat to boating enjoyment unless the problem is so severe that it leaves you dead in the water. One of the most important off-season service jobs every sterndrive owner should complete is to remove the drive from the boat for a “drive-off inspection”. This routine is often overlooked and as a result many major in-season service failures occur due to this omission. The procedure applies to Mercruiser, Volvo, BMW and Cobra drives. If you have ever had a premature failure of the universal joints, gimbal bearing or engine drive coupling, it was probably been caused by the lack of the annual “drive-off inspection”. The reason for removing the drive annually is because there are several very important parts hidden inside the bellows of the sterndrive which require regular service, i.e. greasing and inspection, to continue to operate reliably. The only way to do this is to remove the drive. Also once the boat is launched, service to these items requires a haul-out, which on a larger boat can add several hundred dollars to the bill even before labour charges start to accumulate. Even worse, a hole in a shift cable bellows could cause a nasty leak in your boat that could have disastrous consequences if left unattended! Once the drive is off, you should be looking for two things right off the bat, water and oil. There should be neither water nor oil in the u-joint bellows area. Water in this area means a likely hole in the u-joint bellows, while oil means the drive has a leaking top main oil seal. 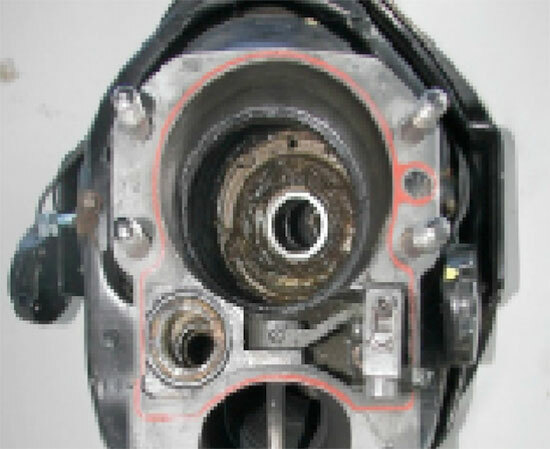 Water will cause the u-joints and the gimbal bearing to wear out very quickly. A leaking upper drive seal will cause oil level in the drive to drop significantly causing a massive and expensive upper drive failure. You would not have discovered either of these problems otherwise, so you can see why this drive-off inspection is so important. If you found water, it is best to replace all the bellows at the same time and replace the gimbal bearing and the u-joints as a precaution. If you found oil, then at the very least replace upper drive housing seals and check all upper drive shaft bearings and gears. Assuming no water or oil was found, you should grease the u-joints and the gimbal bearing, checking for rough spots and/or replace if worn. This is also a good time to check the splines in the u-joint shaft where it goes into the coupling, looking for wear and making sure it has a liberal coating of grease on the splines. This will insure that the coupling will not wear out prematurely. If the coupling fails it requires an engine removal to replace the coupling. Check all other rubber pieces for deterioration and renew as necessary. Check the condition of all power trim and tilt hoses. Look closely for signs of leakage at the hydraulic cylinders. Every one on your boat will thank you come next summer. Make sure you use a new gasket and o-ring set before you re-install the drive and torque all fasteners to specification. Please also note: there are some very specific procedures to follow when removing and installing the sterndrive which are covered in the owners and shop manuals for these units. They should be followed to the letter to insure that you do not break anything and to insure that the drive/shift controls function properly when re-assembled. Also a word of caution: The drive is very heavy, so a lifting apparatus is a good idea or a couple of very strong friends. If you do not have enough confidence to perform this work, please leave it to a professional. The charge will be relatively minor unless anything major is found. Consider it a bargain compared to the alternate cost of a lost weekend in the summer. One way or another, get it done. A pro can also check engine alignment at the same time. It is easy to do when the drive is off, but requires an expensive special tool. All of this assumes you have already done a proper winterizing of the engines and drives, changed the engine oil and filter, changed the gear oil in the drive, fogged the engine with storage oil, stabilized the fuel system and drained and winterized the entire cooling system with antifreeze. Not to mention the head and the freshwater plumbing. If you store your boat with a full service marina, ask them if they do a drive-off inspection as part of their regular winterizing routine. If not, ask to have it done. You will not regret it!